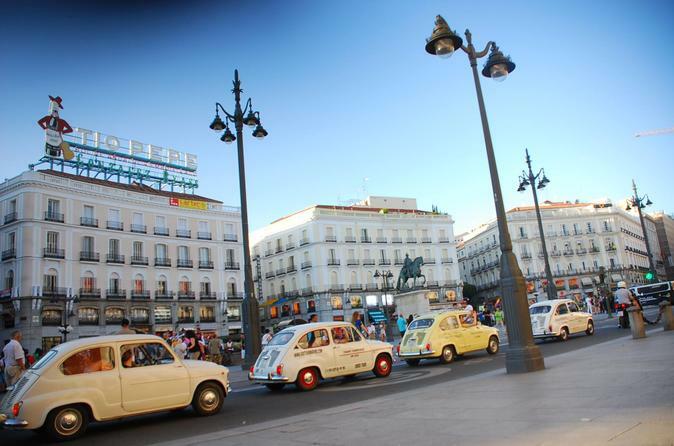 Enjoy the most original way to visit Madrid by the most famous classic car in Madrid (Seat 600), on a 180-minutes of tour. You will visit the most typical places of the city, but also the hiddest and most beautiful places of Madrid. You wil be informed from our guide-drivers, who will explain cultural information. We could pick you up from your hotel and you could finish the tour in the place that you choose (in the downtown of the city). During the tour, there are two stops to take pictures, that we will send you by mail after the tour. In one of our stops you will enjoy the mot typical Spanish " caña y tapa". Our tours begin from your hotel, if the hotel is in the downtown of Madrid. The duration is 180 minutes. In each car there will be a maximum o three people. If you are a group of more people, we offer you up to 10 cars. You will visit the most typical and most beautiful places of the capital of Spain, from the Royal Palace to the Muslim and Christian Wall. You wil find out from the most classic places to the much modern places. From the Austrias District, to Latina! Our guide-driver will explain the tour. They take picture and invite you to taste the most typical "Tapas" of the City in one of the most Antique Taberns of the city. This tour is the most original and funniest of the city.